The Staff Sustainability Network (SSN) officially launched at McGill in January 2018. Developed by Shona Watt, Sustainability Officer and SPF Administrator at the McGill Office of Sustainability (MOOS), the SSN is a monthly gathering of McGill staff who are interested in sustainability or are working toward the Sustainable Workplace Certification. The members meet at lunch for constructive sessions of sharing tips and ideas and celebrating successes, big and small. Last month, the Staff Sustainability Network brought together employees from across the University for an outdoor Lunch and Learn. “The Network is structured to be a positive space where members focus on what works rather than being discouraged by what they cannot change. After all, facing complex challenges requires great motivation and collaboration to yield innovative solutions,” explained Watt. The Sustainable Workplace Certification challenges staff and students throughout the University to foster healthier, more environmentally-friendly, and connected workplaces through individual and collective practices. In addition to monthly Lunch and Learn meetings, MOOS offers various resources to participants who are seeking Sustainable Workplace Certification, including individual office consultations, instructional posters, recommendations on sustainable office supplies, and an online platform (Yammer) for members of the SSN to discuss their work. Carly Breger, Community Partnerships Associate at McGill’s Social Equity and Diversity Education Office, was one of the first members of the SSN. “I have always been interested in community-building initiatives as well as environmental initiatives, so joining was an obvious choice for me. In both cases, navigating such an extensive workplace can be challenging, so it’s great when you find opportunities like this that can help you get started,” she said. Rachel Desjourdy, the Access and Inclusion Officer at the Office for Students with Disabilities, has found helpful linkages in the work she does in disability and accessibility with the topics discussed at the SSN. Connecting with staff who want to make the world a better place is also a big draw for her. “The meetings are helpful because I get to meet a really interesting cross section of the campus’ staff – most of these people are colleagues that I would rarely interact with one-on-one in the context of our everyday jobs, but it’s a great opportunity to build a community at McGill,” said Desjourdy. 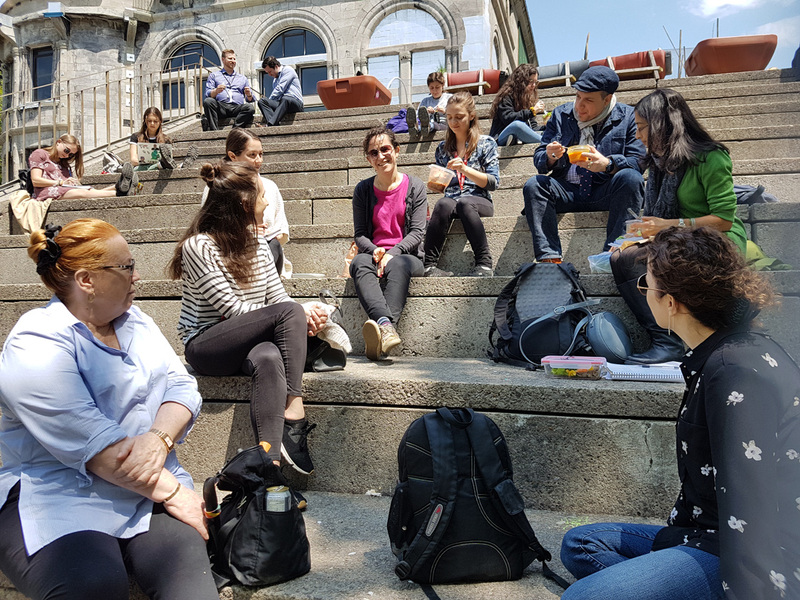 The group’s online platform on Yammer helps build the community of sustainability among staff at McGill by allowing members to quickly and efficiently share questions and receive answers and to spread the word about their own sustainability initiatives. For example, one recent post was about the creation of two boards in an office dedicated to encouraging healthy office habits, like taking a walk and drinking more water. Whether online on in person, members shared that being a part of the SSN has broadened their understanding of what sustainability means. The general consensus from SSN members: come, and bring friends! The next Lunch and Learn on Sustainable Workplace Certification will be from 12-1 p.m. on Tuesday, July 10, at the Office of Sustainability. Please email shona.watt@mcgill.ca to RSVP. Meghan is an undergraduate in the Sustainability Science and Society program at McGill University. As Communications Intern with the McGill Office of Sustainability, she creatively communicates and engages with people about the vibrant sustainability community on and off the McGill campus. She hopes that by spreading the word about sustainability initiatives, people might become inspired to learn what they can do to advance sustainability in their own field of interest.